Kennesaw State University, one of the fastest-growing members of the University System of Georgia, offers high-quality education to students throughout metro-Atlanta and northwest Georgia. To meet the needs of today’s students, Kennesaw State offers day, evening and weekend classes on its spacious suburban campus. Both traditional and nontraditional students will find programs of study to fit their lifestyles and interests. Kennesaw State’s mission of education and service will grow with northwest Georgia. Providing the leadership in this mission is President Daniel S. Papp, former senior vice chancellor for the University System of Georgia. Kennesaw State University is accredited by the Commission on Colleges of the Southern Association of Colleges and Schools to award bachelor’s, master’s, specialist and doctoral degrees. Inquiries related to the university’s accreditation by the Commission may be directed to COC/SACS, 1866 Southern Lane, Decatur, Georgia 30033-4097, telephone 404-679-4500, website: http://www.sacscoc.org. Questions related to admissions and the policies, programs, and practices of KSU should be directed to the university’s offices, catalogs, publications, or websites. The Commission on Colleges of the Southern Association of Colleges and Schools (SACS/COC) is the recognized regional accrediting body in eleven U.S. Southern states and in Latin America for institutions of higher education that award associate, baccalaureate, master’s or doctoral degrees. The bachelor’s and master’s degree programs in business are fully accredited by The Association to Advance Collegiate Schools of Business (AACSB International). http://www.aacsb.edu. The undergraduate and graduate degrees in accounting also have separate AACSB accreditation. The undergraduate and graduate professional education programs are approved by the Georgia Professional Standards Commission for state certification, are nationally recognized by specialized professional associations (SPA’s), and are fully accredited by the National Council for Accreditation of Teacher Education (NCATE). The undergraduate music programs are fully accredited by the National Association of Schools of Music (NASM). The bachelor’s program in theatre is fully accredited by the National Association of Schools of Theatre (NAST). The undergraduate programs in visual arts are fully accredited by the National Association of Schools of Art and Design (NASAD). The baccalaureate program in nursing is approved by the Georgia Board of Nursing, and both the baccalaureate and master’s nursing programs are fully accredited by the Commission on Collegiate Nursing Education (CCNE), the accrediting body of the American Association of Colleges of Nursing (AACN) at One Dupont Circle, NW, Suite 530, Washington, DC 20036-8476. www.aacn.nche.edu. The undergraduate computer science and information systems programs are fully accredited by the Accreditation Board for Engineering & Technology (ABET). The undergraduate chemistry and biochemistry programs are nationally approved by the American Chemical Society (ACS). Kennesaw State University is among the best learning-centered comprehensive universities in the country and is expanding its programs of distinction to meet state and national needs. KSU provides excellent and accessible education, promotes research and scholarship, fosters community engagement, supports intellectual inquiry, and contributes to economic development. KSU alumni are well educated in the liberal arts, leaders in their chosen professions, and engaged citizens whose global awareness and lifelong learning make them visionary leaders for Georgia, the nation, and the world. Kennesaw State University is a comprehensive public university that serves primarily northwest Georgia and Atlanta. With nationally recognized liberal arts, professional, and continuing education programs, KSU offers exemplary disciplinary and interdisciplinary education at the baccalaureate, master’s, specialist, and professional doctoral levels. KSU’s students prosper in a supportive environment with faculty, staff, and administrators who are vitally engaged in student life. KSU’s academic programs are collaborative and creative, emphasizing both the development and application of knowledge. The KSU community values and promotes integrity, global awareness, technological literacy, diversity, and lifelong learning. Goal 1: To enhance and expand academic programs and delivery. Goal 2: To improve retention, progression, and graduation rates while maintaining high quality. Goal 3: To expand campus resources and enhance campus infrastructure. Goal 4: To enhance student life activities and prepare students to be leaders. Goal 5: To improve service, strengthen accountability, and establish a stronger sense of community. Goal 6: To promote an inclusive campus environment through the adoption of policies, procedures, and curricula that are guided by the principles of diversity, equity, transparency, and shared governance. Graduates will demonstrate knowledge, skills and dispositions at an appropriate and effective level of expertise within their field of study as defined by their degree program. Graduates will communicate appropriately and effectively in written, oral, graphic, visual or interpersonal forms as defined by their degree program. Kennesaw State University is convenient to the greater Atlanta area and Northwest Georgia. 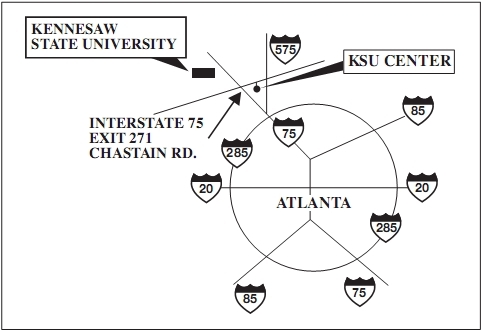 To visit the main campus, take I-75 to Chastain Road, Exit 271, and go west on Chastain Road, about one-quarter mile. See a campus map at http://www.kennesaw.edu/campusmaps.shtml.